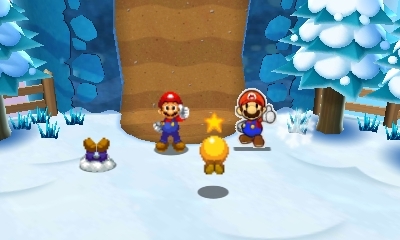 The Mario RPGs, both of Paper Mario and Mario & Luigi sub-brands, tend toward being tedious at times. I love them, but there is no denying it. The Mario & Luigi games tend toward condescending tutorializing and Paper Marios tend to feature funny bits that are just a chore to play. Those are blemishes on otherwise very good games, though the degree to which those flaws derail the experience varies. Nintendo combining the two series was on it’s a terrific idea; it had the potential to be one of the best games of the year, but it also runs the risk of flaws compounding to make one of the most frustrating game experiences imaginable. While Mario & Luigi Paper Jam is not quite the best case scenario, it luckily strays far from the worst case scenario. 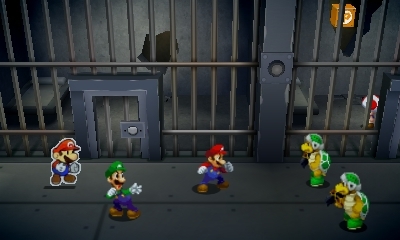 Mario & Luigi: Paper Jam is not really a combination of the different stands of Mario RPGs, it is just a Mario & Luigi game with the Paper Mario characters tossed in. That in itself is one of the better gimmicks in the series, less tiresome that Partners in Time’s babies or Dream Team’s dreams. The Paper Mario stuff is just a flavoring added on to the usual M&L goofiness. They didn’t go quite far enough with the paper stuff, but they got some good use out of the paper doppelgangers. It clearly made it easier to come up with enemies, since they could double up on the Mario staples and have to lean less on new, and generally less interesting, original baddies. I would say that the lack of original characters is a flaw, but the only truly interesting character this series has ever come up with is Fawful. Instead, the game just lets the slightly different Bowsers and Peaches play off each other for some really fun scenes. Comedy has always been a big part of these games’ appeal. That is true of both Paper Mario and M&L. True comedies are rare in games, and even rarer among RPGs. That fact that these games have been consistently funny over almost ten games. While not all of them have been great games to play, they’ve all brought the same sense of wacky irreverence. The two series combined are maybe funniest yet. This is quite an accomplishment for a games with three protagonists, none of which talk. The best bits are the Bowser parts and the seeing the two Peaches outwit the two Bowser Jrs. It never really strays from the conventional Mario cast, but it does really good work with them. 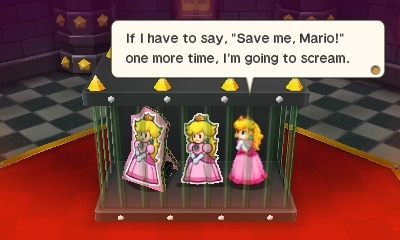 Really, the Paper Mario stuff helps sand down the flaws of the previous M&L game. Dream Team, while not a bad game, was interminable with the tutorials and not especially funny chatter. That is cut down quite a bit in this one. There are still some annoying minigames, but they are less frequent and less onerous. Despite all that this game does well, I still can’t quite say that I love it. I’m not really sure why; it addresses almost all of the problems I had with the previous game. It also brings some much needed challenge to the bosses. They might actually go a little too far into difficult. The story doesn’t do anything special, but it is funny and fast moving. It might just be that the addition of Paper Mario to the team is just too much for me to handle. I can’t manage three separate characters as once. Really, it is just as fun as the game is from moment to moment, it all feels belabored and pointless in the end. What Mario is actually doing is never particularly interesting; he is just going through the motions that make up a Mario game; except this time the gameplay is not as outrageously good as it is in the platform games. When it stops being funny it starts being a drag. Still, those moments are relatively few. Mostly the game is a joy.